Have you ever heard someone make the comment "My prayer didn't get out of the roof" or something like that? What they're trying to say is their prayer was just words, it didn't move God's heart. Why do our prayers fall short? Is step #1 enough? Does saying a prayer = an answer? The Bible says in Matthew 21:22 "And all things, whatsoever ye shall ask in prayer, believing, ye shall receive." It takes more than murmuring a prayer to touch God. We see this clearly when asking for salvation. Do you receive salvation simply because you ask or must you believe? John 3:16 says eternal life comes to those who what? Believe! I'm guilty of the "Agrippa-tude" (Acts 26:28) in my prayers, are you? I pray the words and like a telegraph insert the word "stop" when I'm finished. I don't believe God to come thru with the answer. I imagine God shaking his head in disbelief saying "Tammy, almost thou persuadeth me to answer your prayer if you believed." Christianity isn't a fairy tale or make-believe, it's MUST-BELIEVE. 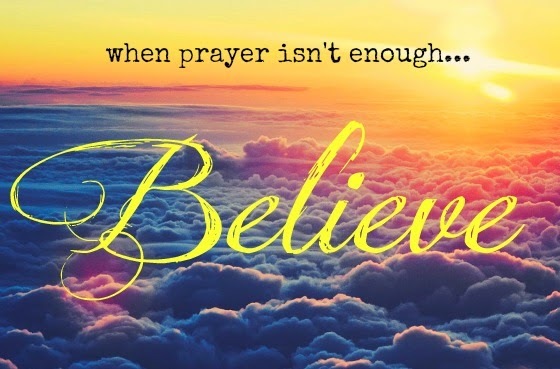 Leave me a comment with your thoughts on prayer and belief. I think that you are absolutely correct, but on the same hand sometimes a tragedy is allowed even though we in our human knowledge may not understand the why except to know that ultimately God will bring about a greater good from it. I know without a doubt that I have prayed believing for my answer of being healed in my body with which I suffer from Ankylosing Spondylitis, Ulcerative Colitis, Fibromyalgia and a host of Mental and emotional issues. But it has not yet happened. Still I keep believing while also knowing that without these illnesses I may not have been as Compassionate, Loving, Caring or as Strong and Brave as I am now because of all the pain and sorrow I have been dealing with my entire life. All this to say this, when it appears to be only Thorns in your patch of life start looking carefully for the roses as you will always find them if you are truly looking for them. Hang in there Karen! I totally agree with you. My handicap has given me the ability to always see the positive and avoid negativity. I've never seen a rosebush that doesn't have thorns. The bush comes out of the ground, gets thorns as it grows and then blossoms into pure beauty at the end of the stem. Kinda like our lives, isn't it?